With this lens and the knowledge that behavioral science provides, we developed frameworks – mental schemes – to help us quickly and effectively use the right tools from our toolbox to address the wide range of challenges that our clients face in seeking insights. is a group of frameworks we use to understand consumer journeys and influences on consumer behavior. It is based on practical applications of behavioral science that underpin how we fashion research techniques into methods and research plans. This approach uses empathy in viewing consumers as human beings – people living out their lives in the context of a world of change. Understanding human experiences and feelings people have associated to products and product characteristics gets us to insights faster. InsightsNow developed unique methods and metrics using these Frameworks that provide more actionable behavioral insights. 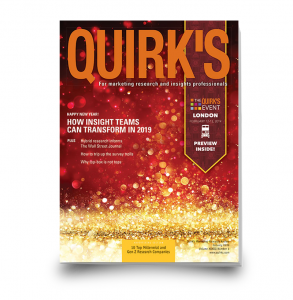 BehaviorLens® frameworks were featured in an industry Outlook article in Quirks Research Journal. Find more about BehaviorLens® and its applications in Founder Dave Lundahl's latest book, Breakthrough Food Product Innovation. or watch some of our past recorded WebinarsNow™ sessions.